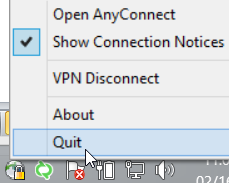 Cisco AnyConnect: Failed to Initialize connection subsystem. I’m not sure what it is about the most recent security updates that made it stop working, but I found that by setting it into Windows 7 Compatibility mode the issue was resolved. Then re-launch the AnyConnect client. and all seems to work.